Most folks can probably identify an adult firefly, but can you identify a larval one? I found this little guy (or girl?) this past summer on a driveway in eastern Pennsylvania. These fascinating – and garden-friendly! – insects are facing massive population declines due to habitat loss, light pollution, and pesticide exposure. You might wonder how you can help fireflies. Well, as it turns out, encouraging them to take up residence in your yard is as easy as 1, 2, 3! Step 1: Understand fireflies – You can’t help fireflies unless you know a few important facts about them. Members of the Lampyridae family of beetles, fireflies are found on every continent except Antarctica, and there are about 150 different species of fireflies in North America. Also commonly called lightning bugs, the adult insects use their bioluminescent abdomens to attract mates. The pattern of flashes is unique to each species, as is the color of their glow (it’s like an insect Morse code for mating!). Males fly around flashing a particular pattern in hopes of finding a female of the same species. He signals first, then she signals her response, often from a low perch. Flash pattern charts can be used to distinguish many common species based on the number and duration of their flashes. In the eastern U.S., fireflies are a common summer sight, and while not all species glow as adults, they all do as larvae. Sometimes called glowworms in other parts of the world, larval fireflies, like the one pictured in the feature photo, emit a steady, dull glow from their abdomens. At night, the bioluminescent abdomen of this adult firefly emits a flash pattern specific to its species in hopes of attracting a mate. 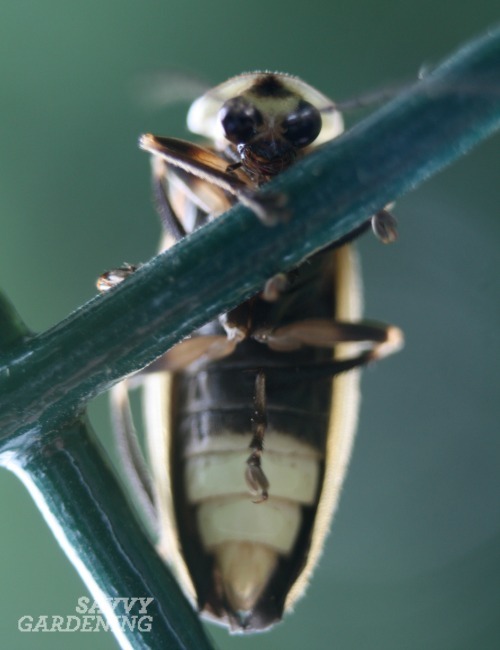 Step 2: Create habitat – Adult fireflies eat mostly pollen and nectar, though some species eat nothing at all. There’s no specific list of plants that attract fireflies, just make sure your garden contains a broad diversity of flowering plants, with varied bloom-times, flower colors, and floral shapes. Female fireflies lay eggs in the ground (though a few tropical species lay eggs in trees). Their favorite egg laying sites include moist places near ponds and streams and in leaf litter. To really help fireflies, do not fill in low-lying boggy areas of your yard, or better still, create a rain garden to purposefully channel rainwater into a suitable habitat. Do not collect fallen leaves from wooded areas. Step 3: Eliminate pesticides – Removing all pesticides from your gardening repertoire is a huge way to help fireflies. Because larval fireflies live under or on the ground and serve as generalist predators, savoring slugs, snails, worms, and other ground-dwelling organisms, they are very susceptible to pesticide exposure, particularly to pesticides applied to the lawn. Avoid pesticides all together and skip the chemical lawn fertilization, too. The salts in many fertilizer products can easily desiccate any larval fireflies they come in contact with. Oh, and one final step you can take to help fireflies: Turn off all unnecessary lights on summer nights. The fireflies certainly don’t need the distraction…and frankly, you probably don’t either. After all, the gorgeous glow of the fireflies is the only light you really need! Tell us what you think about fireflies in the comments below. How do you encourage fireflies but not mosquitoes? I was thinking the same thing. The whole time I was reading, I was thinking that this is a recipe for a mosquito breeding ground. Great question! Larval fireflies do not live in water, but mosquito larvae do. The trick is to have some low-lying areas with saturated, damp soil that don’t contain any standing water. Firefly larvae need soil and they need air to breathe, so they want damp sites, not standing water. Good timing on this article. Last week, for the first time in YEARS, we saw fireflies on our newly purchased property. It was quite exciting for me because I will trying to grow things to attract as much varied wildlife as possible.